All-in-one Membership includes all the products that we offer for CCIE Evolving Technologies V1.1 exam section. Get instant access to Study Guide (120 pages, PDF), hundreds of Practice Questions, ExamSkope(TM), and 16 lessons of video learning including NetDevOps configuration management lab. The study guide includes updated material from Cisco CCIE Evolving Technologies V1.1 Update, which has been in effect as of August 30 2018 and applies to ALL CCIE and CCDE written exams. Why CCIE Evolving Technologies section is such a big deal? Well, there are two major reasons. Evolving Technologies carry about 10% weight that you can expect to see in your next CCIE written exam. 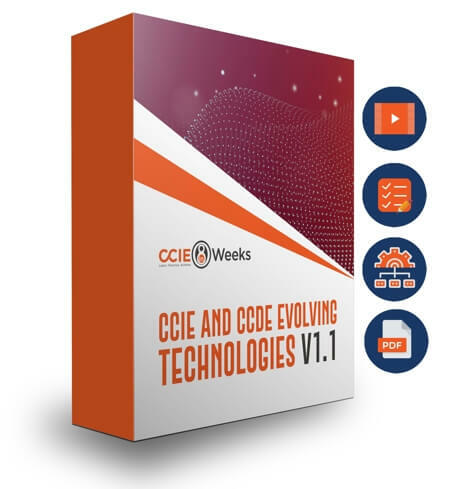 Evolving Technologies topics also are mandatory across all CCIE and CCDE written exam tracks. Our All-in-One Cisco CCIE Evolving Technologies V1.1 Certification Training Bundle offers a cost-effective way to get the industry-renowned CCIE Written training resources you need to learn for and pass your exams with full confidence. Combining conveniently viewable video courses, online PDF study guide or workbook, study plans and quizzes that allow you to practice until you have nailed down your weak areas, this training bundle provide complete self-paced training solutions at an amazing value. Cisco’s CCIE certification is one of the most prestigious and respected certifications in IT. It is designed for senior network engineers, network architects, network managers and other networking professionals who are involved in the implementation, operation and troubleshooting of complex network infrastructure, and enterprise networking environments. Achieving your CCIE certification demonstrates a mastery of network engineering skills and an expert-level knowledge of Cisco products and solutions, and will put you among a group of the most sought-after and valued professionals in the industry. Get instant access to hundreds of CCIE 400-101 (V5.1) Practice Questions. These quizzes includes updated material from Cisco CCIE Evolving Technologies V1.1 Update.All of our quizzes are structured around Cisco official blueprint sections for your CCIE track.CCIE Evolving Technologies V1.1 Quiz contains all of the questions that we have available for Cloud, SDN and IOT related topics as far as all CCIE and CCDE written exams are concerned. These quizzes are not timed and right/wrong feedback is provided immediately after you answer each question. We recommend you that you take each category quiz after completing the corresponding chapter or part in your CCIEin8Weeks study guide. Click on “View questions” for review and explanation. Which of the following statements underscores the use of Cloud Management package within Cisco ONE Enterprise Cloud Suite? Choose the best. With Cloud Management module, you get all the tools you need to deploy, provision, and manage applications across your data center and private and public cloud environments. With time savings of up to 60 percent, this single-application profile modeling and deployment approach supports faster time-to-market and provides the speed and flexibility needed to deploy applications in multiple environments. Which of the following statements underscores the use of Service Management package within Cisco ONE suite? Choose the best. With Service Management module, you get all the tools you need to deploy, provision, and manage applications across your data center and private and public cloud environments. With time savings of up to 60 percent, this single-application profile modeling and deployment approach supports faster time-to-market and provides the speed and flexibility needed to deploy applications in multiple environments. Which of the following statements are correct regarding Field Area Network or FAN? Choose two. The Cisco multi-service FAN solution is based on a flexible two-tier architecture that generates IP network services such as security, quality of service, resilience, and management supporting use cases such as Advanced Meter Infrastructure (AMI), Distribution Automation, and workforce automation. The Cisco multi-service FAN solution is based on a flexible three-tier architecture that generates IP network services such as security, quality of service, resilience, and management supporting use cases such as Advanced Meter Infrastructure (AMI), Distribution Automation, and workforce automation. Which of the following statements describe the functions of NFV? Choose two. Network functions virtualization (NFV) elements (or NFV Elements) are the discrete hardware and software requirements that are managed in an NFV installation to provide new communications services and applications services on commodity-based hardware. NFV services are deployed on commercial off-the-shelf (COTS) hardware platform, typically run on Intel X86-based hardware and standard switching hardware. The purpose of using an VNF platform is to host various NFVs. Which of the following statements are true regarding Docker containers? Choose three. The image defined by your Dockerfile should generate containers that are as non-ephemeral as possible. “Non-ephemeral,” means that the container can be stopped and destroyed, then rebuilt and replaced with an absolute minimum set up and configuration. FROM, TO, CC, COPY, RUN and CMD are valid commands that can be used inside a Dockerfile. Which of the following statements are valid regarding Cisco Virtual Topology System (VTS)? Choose three. The Cisco Virtual Topology System (VTS) is an open, standards-based overlay management and provisioning system for data center networks. It automates fabric provisioning for both physical and virtual workloads. The Virtual Topology System doesn't support hybrid overlays which would require stitching together physical and virtual endpoints into a single VXLAN segment. Which of the following statements are true about Intel’s DPDK? Choose two. Which of the following statements are true about Linux LXCs and KVM? Choose two. The TUN/TAP subsystem creates a virtual ethernet interface attached to a process. Which of the following statements attest to fundamentals that are needed in order to have success with IoT deployments? Choose five. Software-as-a-Service models delivered via the cloud are ideal for IoT businesses. When you are ready to move into new markets, you don’t want anything to slow you down. As you build your IoT business, take time to think long term and anticipate success. It’s important to learn from best practices, even if the tips and inspiration come from different industries. Which of the following statements are true regarding LoRa (Long Range) and IoT? Choose three. Which of the following statements are true about 6LoWPAN and ZigBee? Choose two. 6LoWPAN can communicate with 802.15.4 devices as well as other types of devices on an IP network link like WiFi. A bridge device can connect the two. It’s the newest competitor to ZigBee. 6LoWPAN can communicate with 802.15.4 devices as well as other types of devices on an IP network link like WiFi. A bridge device can connect the two. 6LoWPAN can communicate with 802.15.4g devices as well as other types of devices on an IP network link like WiFi. A bridge device can connect the two. It’s the newest competitor to ZigBee. Which of the following statements are correct regarding BGP-LS? Choose two. BGP-LS sends information from IS-IS or OSPF topology database through BGP updates to the SDN controller. Traffic Engineering Database (TED), which are built by OSPF and OSPF-TE extensions, are typically distributed by IGPs within the network. Which of the following statements are valid with regard to Fog computing? Choose two. Fog computing brings processing close to the data source, and it does not need to be sent to a remote cloud or other centralized systems for processing. By eliminating the distance and time it takes to send data to centralized sources, we can improve the speed and performance of data transport, as well as devices and applications on the edge. Which of the following statements are true regarding TUN and TAP are virtual network kernel interfaces? Choose three. TAP (namely network tap) simulates a link layer device and it operates with layer 2 packets like Ethernet frames. TUN is used with routing, while TAP is used for creating a network bridge. A kernel-space program may also pass packets into a TUN/TAP device. In this case the TUN/TAP device delivers (or "injects") these packets to the operating-system network stack thus emulating their reception from an internal source. TUN (namely network TUNnel) simulates a link layer device and it operates with layer 2 packets like Ethernet frames. TUN is used with routing, while TAP is used for creating a network bridge. Which of the following statements are true regarding Five Fundamentals for IoT Success as per Cisco? Choose five. Companies that prioritize the development and delivery of value-added connected services will have a competitive advantage. As new functionality is made possible through the cloud, industries are embracing innovative business practices that improve operational efficiency, lower costs, and enable them to respond more quickly to evolving customer needs. Whether you are a multinational corporation or a regional or niche player in your industry, you will need to scale your business if you want to thrive. Automate every process possible to reduce resolution times and streamline operations, and make your business more responsive and cost-effective. Whether you are a multinational corporation or a regional or niche player in your industry, you will need to ensure that you don't scale your business too quickly if you want to thrive. You cannot automate every process possible, so automate what you can to reduce resolution times and streamline operations, and make your business more responsive and cost-effective. How are Cisco ONE Enterprise Cloud Suite offers related to Cisco CloudCenter? Choose two. Cisco ONE Enterprise Cloud Suite offers include four pillars, one of which, known as Cloud Management consists of Cisco CloudCenter Manager and Orchestrator. Cisco ONE Enterprise Cloud Suite offers include areas of Cloud Management, Infrastructure Automation, Workload Optimization, and Service Management. Cisco ONE Enterprise Cloud Suite offers include areas of Cloud Orchestration, Infrastructure Automation, Workload Optimization, and Service Management. Cisco ONE Enterprise Cloud Suite offers include four pillars, one of which, known as Cloud Orchestration consists of Cisco CloudCenter Manager and Orchestrator. Which of the following statements are valid about creating Connected Agencies for Public Safety Using the Internet of Everything (IoE)? Choose two. Which of the following operations are included in the NETCONF base protocol as per RFC 6241? Choose five. Configuration Protocol (NETCONF) and YANG, a data modeling language, to help remove the time, cost and manual steps involved in network element configuration? Choose the best. NETCONF is a standard way of deleting, editing and installing configuration of network devices? Choose the best. Which statements correctly describe the benefits of YANG model? Choose three. Which of the following statements are valid regarding RPL packet formats? Choose four. DAG Information Object (DIO), RPL DIO messages are sent for DODAG discovery and maintenance. DIO are multicasted according to trickle timers. DIO messages are used for DODAG discovery and maintenance. Destination Advertisement Object (DAO), Destination Advertisement Object (DAO) is used to propagate destination information Upward along the DODAG. In Storing mode, the DAO message is unicast by the child to the selected parent(s). In Non-Storing mode, the DAO message is unicast to the DODAG root. The DAO message may optionally, upon explicit request or error, be acknowledged by its destination with a Destination Advertisement Acknowledgement (DAO-ACK) message back to the sender of the DAO. Which of the following DevOps tools is considered the build server? Choose the best. Which of the following is the defining characteristic of SDN going back to its early days? Choose the best. By taking the control plane off the individual network hardware and running it as a centralized software instead, the SDN controller facilitates automated network management and makes it easier to integrate and administer business applications. By taking the data plane off the individual network hardware and running it as a centralized software instead, the SDN controller facilitates automated network management and makes it easier to integrate and administer business applications. By taking the management plane off the individual network hardware and running it as a centralized software instead, the SDN controller facilitates automated network management and makes it easier to integrate and administer business applications. By taking the control and data planes off the individual network hardware and running them as a centralized software instead, the SDN controller facilitates automated network management and makes it easier to integrate and administer business applications. Which of the following statements are true about CloudCenter logging? Choose three. CloudCenter maintains 10 revisions of these log files. The CloudCenter platform generates log files for each major component to help troubleshoot problems and error. CloudCenter log files are generated through the log4J library and follows the log4j format. CloudCenter maintains 20 revisions of these log files. CloudCenter maintains 5 revisions of these log files. CloudCenter log files are generated through the log3J library and follows the log3j format. Which of the following are valid and supported CloudCenter application profiles? Choose two. Which of the following statements are valid about CloudCenter upgrade procedure? Choose four. Upgrading the CloudCenter version generally requires only one step – to run the latest appliance jar files on each component. Appliance jars are only applicable to the CCM, CCO and AMQP components. In releases involving security patches, upgrade of software packages and addition or change of software packages to a component would require an additional step to run core upgrade binary file. Effective, CloudCenter 4.8.2, the CloudCenter platform converts the Monitor component to the LOG_COLLECTOR as part of the upgrade process – you do not need to delete the monitor instance and setup a new log collector. Effective, CloudCenter 4.8.0, the CloudCenter platform converts the Monitor component to the LOG_COLLECTOR as part of the upgrade process – you do not need to delete the monitor instance and setup a new log collector. Upgrading the CloudCenter version generally requires only one step – to run the latest appliance jar files on each component. Appliance jars are NOT only applicable to the CCM, CCO and AMQP components. Which of the following statements are true about CloudCenter backup and restore in non-HA mode? Choose three. To effectively manage your CloudCenter deployment, backup your deployment on a daily basis – you can setup a cronjob to automatically perform this backup. Backup the webapp folder containing the exploded war files to a backup folder (the following example uses /mnt, you can change this directory as applicable). For AMQP, the back up scenario is not applicable in the non-HA mode as there is no known data that can be persisted. For CCO, the back up scenario is not applicable in the non-HA mode as there is no known data that can be persisted. Which of the following would be considered monitoring best practices for CloudCenter? Choose four. The CCO, CCM, and other CloudCenter Architecture must all run the same CloudCenter version—they cannot run different CloudCenter versions. At the system level, you can monitor your VMs to harvest memory usage, disk usage, and CPU usage. You can use any third-party monitoring tool (for example, Sensu open source monitoring framework) to collect system-level data from clients, to monitor VMs, and to provide statistics on usage. You can choose to use this monitoring framework or any other framework that works for your enterprise. Based on the statistics harvested while monitoring the CloudCenter platform, admins can get a fair idea of how the platform performance. Once you install CloudCenter successfully, ensure the security if your CloudCenter platform and data. If the CloudCenter platform becomes unavailable due to any remote safety-related issue, be sure to have a plan in place to monitor, backup, and restore your CloudCenter platform and data. Which of the following statements are true regarding 802.11p IoT standard? Choose three. IEEE 802.11p standard typically uses channels of 40 MHz bandwidth in the 5.9 GHz band (5.850-5.925 GHz). Which of the following statements underscores the use of Infrastructure Automation package within Cisco ONE suite? Choose the best. Which of the following statements are correct regarding Git version control system? Choose two. Git is free and open-source software distributed under the terms of the GNU General Public License version 1. Which of the following statements are correct regarding SD-Access? Choose two. SD-Access configures the overlay network with a fabric data plane by using virtual extensible LAN (VXLAN) technology. The SD-Access 1.1 solution supports IPv4 overlays. Overlapping IP addresses are also supported for wireless clients on the same WLC. The SD-Access 1.1 solution supports transport of only IP frames in the Layer 2 overlays, without Layer 2 flooding of broadcast and unknown multicast traffic. Without broadcasts from the fabric edge, ARP functions by using the fabric control plane for IP-to-MAC address table lookups. Which of the following statements are correct regarding Ansible playbooks? Choose two. An Ansible playbook contains one or multiple plays, each of which define the work to be done for a configuration on a managed server. An Ansible playbook always contains multiple plays, each of which define the work to be done for a configuration on a managed server. Which of the following are the most common types of SD-WAN deployments? Choose three. With a managed service SD-WAN, the customer pays a service provider to install and deliver connectivity, as well as any appliances the service may require. With SD-WAN as-a-Service, companies acquire SD-WAN much the way they buy cloud services today, using a consumption model. With a unmanaged service SD-WAN, the customer pays a service provider to install and deliver connectivity, as well as any appliances the service may require. Which of the following are true about management of Cisco fog computing? Choose two. Manufacturers manage their fog nodes using Cisco Prime Infrastructure. Administrators use a single interface to manage the network, fog nodes, applications, and users. You can also deploy your own management and automation tools on Cisco fog nodes, using Cisco Prime APIs. Which of the following data encodings are possible with NETCONF, RESTCONF and gRPC protocols? Choose three. Which of the following statements are true regarding Cisco SD-WAN vEdge? Choose three.